E uno Grilles flush bolted from the outside. The workmanship of LEGI E uno is of course of proven LEGI quality. 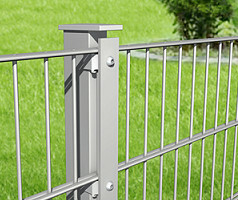 The fence system is optionally available in two versions. For the LEGI E uno R version, the grilles are mounted to the post by means of a clamping plate, while the LEGI E uno R+K version is supplied with a clamping strip. Using clamping plates has weight advantages and is therefore a more economical aspect. It also provides installation advantages for radial / polygonal running property lines. For planning and installation, the clamping strip is an easy advantage, because fewer parts always means a certain amount of time saved during construction. LEGI E uno R is bolted from the outside, i.e. standing outside of the property. 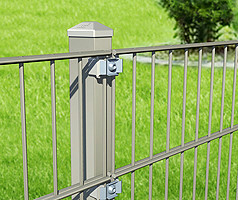 This variation will meet the basic requirements for fencing in property. LEGI E uno R+K is also bolted from the outside, but by using a clamping strip, which supports the linear appearance of the post.